One of my favourite foods, unagi, is skyrocketing in price in Japan, and I am inconsolable. You wouldn't think that eel would be a go-to dish for a picky eater raised most of her childhood in a smallish town. Yet for the first few weeks I was in Japan, it was often the first thing I reached for, simply because there was no chance of surprises. The tender eel, the tangy sauce, the filling bed of rice - when I bought unagi I knew what I was getting. I even bought grilled eel from the grocery store and took it home to eat with homemade rice. I had only eaten eel a few times in Canada. One summer in university, my friends and I lived in Markham and we frequented an all-you-can-eat sushi restaurant called Umi Sushi. We decided that we had the appetite and will to order and eat the entire menu between the four of us. Well...I'm not the outgoing sort when it comes to food, so I left most of the adventure to my friend Drew. (And just about all of the hand rolls.) I did find that I favoured the BBQ eel sushi - that is, unagi. I suppose even after just those few times in Markham, eel seemed like a safe choice when I landed in Tokyo, even though there were tons of options everywhere I looked. You should know, too, that eel supplies are dwindling - they are being overfished, so I try not to eat it very often. It's also harder to get quality eel now that I'm home, so I save it for special occasions. My eel-eating has dwindled. But I'd always recommend eel to someone uncertain about Japanese food, especially if their issue is mostly with the "raw fish" aspect (and many of you probably know that most 'sushi' that you get here doesn't involve any raw fish at all!). 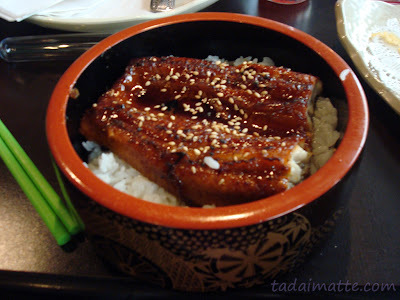 A bed of hot rice and some grilled eel on top with plenty of sauce - yes! Delicious. Try it at least once while eel is still an affordable treat - you won't be disappointed.